A Bikla Bike Share Station with a bike map and cycling directions. ©Ryan H.
In Guadalajara, a group of bicycle activists called Bicipublica have created a completely new form of bike sharing system. They were inspired by Velib in Paris and Bixi in Montreal, but in Guadalajara, there was little political support for creating a municipal bike share system. Instead they funded their own system by selling bike racks called “Cycle Ports” to local businesses. Their system is much more affordable and easier to implement than existing bike share models. The cycle activists use the resources of existing businesses to check bikes in and out to bike share members. This economical and innovative approach to bike sharing is a model that these Guadalajara cycle activists believe can be copied all over the world. 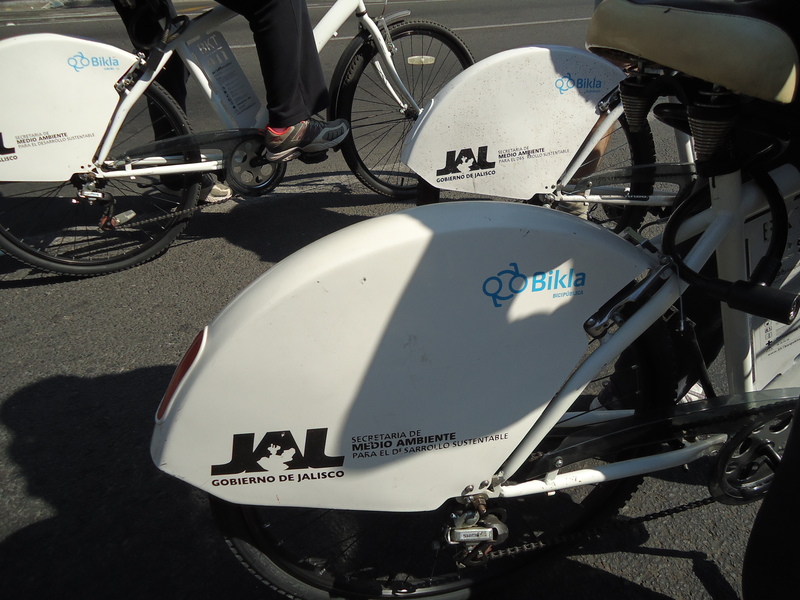 The Guadalajara system is called Bikla and is different from all other common modern bike sharing systems. The Bikla system does not rely on government subsidies, advertising contracts, or GPS & SIM card tracking devices. Bikla relies on members & existing businesses that want to promote cycling and their location. The Bikla bike share system works very simply. People purchase a membership for around $15 USD a year. They are given a Bikla ID card that lists the 21 bike share stations and their hours of operation. Each of the participating businesses is required by Bikla to have internet access and a Cycle Port or “staple” style bike racks. These businesses are cafes, restaurants, bookstores, etc. throughout central Guadalajara. When a Bikla member arrives at one of these businesses to check out a bike, the staff logs onto the Bikla website & enters the members ID number. The member is assigned one of the bikes that are locked up outside and the staff of the business gives them the corresponding key. When the Bikla member is done with the bike, they can return it to any of the participating businesses, lock to the Cycle Port, and have the business staff log the return of the bike and deduct “Bike Time” from the user’s card. This system is unusual because it is so simple and affordable. The entire bike sharing infrastructure consists of bikes, normal keyed locks, bike racks, and businesses with internet access. The businesses do not pay to participate, except for purchasing a bike rack and Bikla does not pay the businesses for being a part of the system. Each business benefits from being a station by increasing their exposure to potential customers. Mario Delgado & Itcell Islas, the Director & Grachic Designer for Bikla ©Ryan H.
The activists at Bicipublica have used inexpensive internet technology to enable members to pay for “Bike Time” and check on the web to see where bikes are currently available. 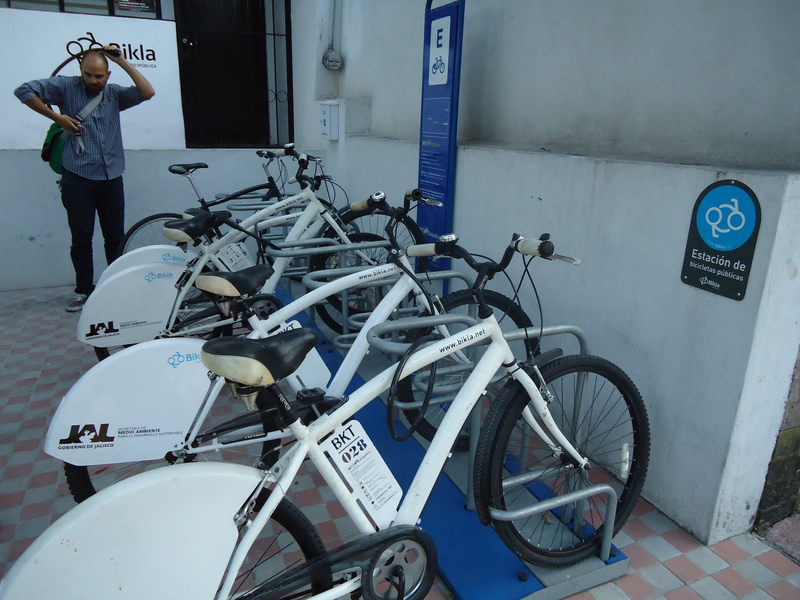 The Bikla mapping also lets them administer a system of bikes throughout Guadalajara. Internally, they are able to track bikes that are overdue or those that need maintenance. The Bikla bike share system employs one mobile mechanic who each day heads out into the city with the necessary tools to keep the bikes functional. As staff of participating businesses check bikes back in, they can log any maintenance issues. The mechanic, Santana Rodriguez Noe, conducts triage on the fleet and picks the bike in the worst shape to pedal home each day. The next morning, that bike gets a complete overhaul and heads back onto the streets as the best running bike in the system. Bikla Bikes in action on the weekly Via Recreativa, car free Sunday ©Ryan H.
Bikla has become a great success in Guadalajara. The system was launched two years ago and now has over 2,600 members. The organizers believe that their system is 30% less expensive than other modern bike share systems funded by advertising like EcoBici in Mexico City. The success of Bicipublica has led to talks to launch Bikla style systems in many other cities throughout Mexico. The Guadalajara municipal government and the local newspaper have also both launched their own separate and different bike sharing systems. Bike sharing has become an integral part of the cycling culture in Guadalajara. For additional information check out their website http://www.bikla.net, which has an english translation. We are currently travelling overland and sea from Portland, Oregon to Puerto Montt, Chile investigating Latin American cycling culture.